Ahmed BenDriss El Yacoubi, by his own account a descendant of the Prophet Mohammed, was born in Fez, Morocco, in 1928. Educated as a traditional healer, he was also known as a storyteller, poet, painter, playwright and the author of the Alchimist’s Cookbook. In summer 1947, Yacoubi met the American writer and composer Paul Bowles. For over a decade they maintained a close, maybe romantic relationship, with Bowles supporting his protégé in every way possible. They travelled together extensively and from 1954 shared a flat in Tangier. After his relationship with Bowles had cooled off, Yacoubi married twice and settled in New York where he died in 1985. In 1948, Bowles’s wife Jane spotted Yacoubi’s creative talent when he scribbled some drawings on hotel stationary. From then on, the Bowles fervently nurtured the young man’s artistic development and career. They helped organise exhibitions for him, for example at Betty Parson’s Gallery in New York in 1952, and introduced him to influential people, such as wealthy singer and actress Libby Holman, with whom he briefly lived in New York in 1953. Yacoubi’s early work featured zoomorphic creatures but he soon committed to abstraction. Despite that, his work is usually labelled as Naïve Art. It is reported that Yacoubi played the flute to new paintings ‘to bring them to life’ and his work was described as ‘magnificent’ and full of ‘madness and directness’. His paintings are today held by major institutions such as MoMA, New York, and the Barjeel Art Foundation in Sharjah, UAE. Between 1924 and 1956 Tangier was an International Zone. Especially after 1945, it became known for its liberal lifestyle, which made it a popular destination for many Western artists, writers and intellectuals. 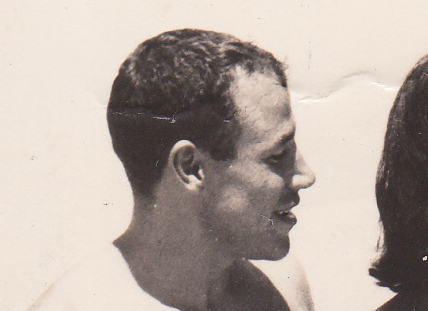 Bacon’s then partner, Peter Lacy, emigrated to Tangier in 1955, and between 1956 and 1961, the artist spent every summer with him in North Africa. Bacon’s circle of friends there was exquisite and included William Burroughs, Brion Gyson, Allen Ginsberg and the Bowles, who introduced him to Yacoubi. ‘Charismatic, vital and seductive to both sexes, Yacoubi came to personify the attractions of life in Tangier for many expatriates. When he was not battling with a new picture, he spent his time displaying his remarkable physique on the beach,’ Michael Peppiatt commented. For Bacon, he was simply the ‘most sympathetic Moroccan in Tangier’. ‘Ahmed and I had no common language,’ he remembered, ‘but between my limited Spanish and French and his very good Spanish, we were able to talk a lot.’ Several sources underline his genuine affection for the young man. Even though impeded by the strenuous relationship with Lacy, Bacon painted in Tangier, first in a studio in the Casbah, and from 1959 in his own flat at Blvd Mohammed V 105. He probably destroyed most works he created there, but some, including ‘Pope with Owls’, c.1958, survive today. Jane Bowles had encouraged Yacoubi to use oils, but because he initially failed to master them, her husband asked Bacon for help. It was agreed that in order to learn, Yacoubi would come to his studio and watch him work, and Bacon taught him about technique, supplied him with Winsor and Newton paints and canvases from London, and gave him his discarded paintings to work on the verso. Bacon also persuaded his dealer, Erica Brausen, to organise an exhibition for him at the Hanover Gallery in London. ‘Achmid [sic] has done some very good new paintings and it should be a very good show’, he wrote to her. The exhibition in 1957 was praised by one critic as ‘his drawings would have delighted the eye of Paul Klee’. Yacoubi forms the only reported case of Bacon mentoring another artist. In 1957 Yacoubi was arrested twice for the alleged seduction of an underage boy, and was only acquitted of all charges in May the following year. Until Yacoubi was bailed out of prison by Paul Bowles, Bacon supplied him with food, canvases, and support. The incident was perceived as an indicator of the new Moroccan government’s changing attitude towards homosexuality and a precursor of the end of the free life in Tangier. It led to an exodus of Westerners, among them the Bowles. After Lacy’s death in 1962, Bacon’s regular visits to Tangier came to an end too. In Helen Lessore’s account, Bacon’s Man Carrying a Child, 1956, is a ‘portrait of a man he knew there’, but there is no evidence that it depicts Yacoubi. Iain Finlayson, Tangier City of the Dream (London: Harper Collins Publishers, 1992), pp. 134-35. Finlayson, pp. 167-68, Dillon, p. 223-24. Dillon, p. 222, 226. Finlayson, p. 137. Naima Salam, Marokkanische und europäische Kunsttraditionen als Inspirationsquelle für die marokkanische Malerei der Gegenwart (Münster: LIT Verlag, 2004, Schriftenreihe der Stipendiatinnen und Stipendiaten der Friedrich-Ebert-Stiftung, Band 23, doctoral thesis, University of Cologne, 2003), p. 69. Daniel Farson, The Gilded Gutter Life of Francis Bacon (London, Sydney, Auckland, Johannesburg: Century, 1993), p. 156 and Jane Bowles in Finlayson, p. 134.
 http://www.barjeelartfoundation.org/collection/untitled-ahmed-ben-driss-el-yacoubi/ [accessed 02 March 2018] and https://www.moma.org/artists/6476 [accessed 08 March 2018]. Martin Harrison, ‘Chronology’, in Francis Bacon: Catalogue Raisonné, ed. by Martin Harrison (London: The Estate of Francis Bacon, 2016), Vol.I, pp. 74-101 (pp. 85-86). Farson, p. 157, Harrison, Vol.I, pp. 74-101, p. 86, Michael Peppiatt, Francis Bacon in the 1950s (New Haven, Conn., London: Yale University Press, 2006), p. 168. Michael Peppiatt, Francis Bacon: Anatomy of an Enigma (London: Weidenfeld & Nicholson, 1996), p. 213. Farson, p. 155, 157, Peppiatt, 1996, p. 213. Harrison, Vol.I, pp. 74-101, p. 87, cf. e.g. Farson, pp. 160-163. Francis Bacon: Catalogue Raisonné, ed. by Martin Harrison (London: The Estate of Francis Bacon, 2016), Vol.III, p. 542, 554. Farson, p. 160, Andrew Sinclair, Francis Bacon His Life and Violent Times (London: Sinclair:Stevenson, 1996), p. 138. Letter from Francis Bacon to Erica Brausen, presumably 29 May 1957, transcribed in Peppiatt, 2006, p. 148. ‘Ahmed Yacoubi Paintings and Drawings’, Hanover Gallery, 10 October - 1 November 1957, reviewed by Andrew Forge, ‘Round the London Galleries’, The Listener, 58 (1957), p. 574. Farson, p. 158, Sinclair, p. 138. Cf. e.g. Farson, p. 158, Sinclair, p. 138. Cf. Harrison, Vol.I, pp. 74-101.